This SEM Sample Stub Vacuum Desiccator is intended to use for most SEM pin stubs. It is very simple to use. 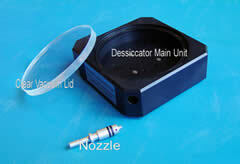 Unit includes Desiccator Main unit, Clear Vacuum Lid, and Air Nozzle. Introduce the Air Nozzle with the threaded end into the opening on the side of the main unit. Apply the vacuum hose to the nozzle and pull the vacuum – you can use any vacuum sources. We use our small vacuum pick up system Cat #71894, it works very well. After about one minute, while vacuum still pulling, you PUSH the nozzle all-the-way-in to lock the vacuum unit, and carefully remove the vacuum hose away without pulling the nozzle. Now you can unscrew the nozzle by turning it anti clockwise 4 to 5 turns, until the “O” ring is completely exposing, then you pull the nozzle away from the unit. Keep the nozzle in safe place for next use. Note: The unit comes with vacuum grease already applied to the large “O” ring inside the storage cavity. DO NOT DROP, SCRATCH OR DAMAGE THE UNIT. 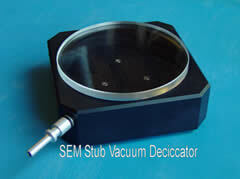 Sample Stub Vacuum Desiccators are available online from the EMS Catalog. For ordering or product information, click here.